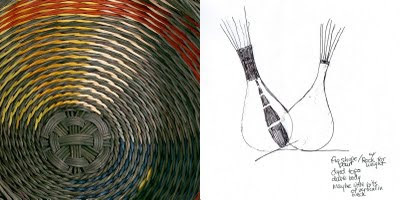 Very excited by the idea of a huge basket - at what point does it stop being a 'basket' and start becoming a sculpture? oooooh... that sounds wonderful. I've always loved the smooth sides of your hairy baskets.... and the fig shapes? NICE! @ mountainear - that has always been a sticky point. Art v.s. craft. Is it the size, the functionality, the material, the context ...? Nope, my head has just turned inside out trying to imagine the technical stuff of the weaving; but it looks and sounds very exciting - big baskets = always good. I would place it in the art category, considering the amount of thought, conceptualising and ultimate size of it.